"I was the guy that would cram for everything, so I guess I was a bit of a slacker. I was a procrastinator. I spent a lot of all-nighters getting ready for tests." I know I’m not alone in saying I hated taking standardized tests. The pressure of having to finish within a proscribed time period combined with not knowing precisely what would be on the test generated a high level of anxiety. And to top it off, it often took weeks before I found out the results. Taking tests for classroom subjects in high school and college were easier because the teachers and professors reviewed what exactly would be on them and I usually found out fairly quickly what my grade was, which alleviated the anxiety of waiting and wondering how I’d done. English Language Learners, who have to respond not only to content-area questions but must also do it in a language they are not proficient in, have it doubly hard. But there are lots of things teachers can do to help ELLs succeed on the tests they have to take. I taught my students strategies for taking tests that I myself had successfully used when studying for a foreign language placement exam for a French program and for the Massachusetts test to become certified in teaching Social Studies. I created a resource based on those strategies and additional research and while I can’t guarantee your students will ace all the tests they take, implementing them should give them confidence and help them better prepare for their exams. 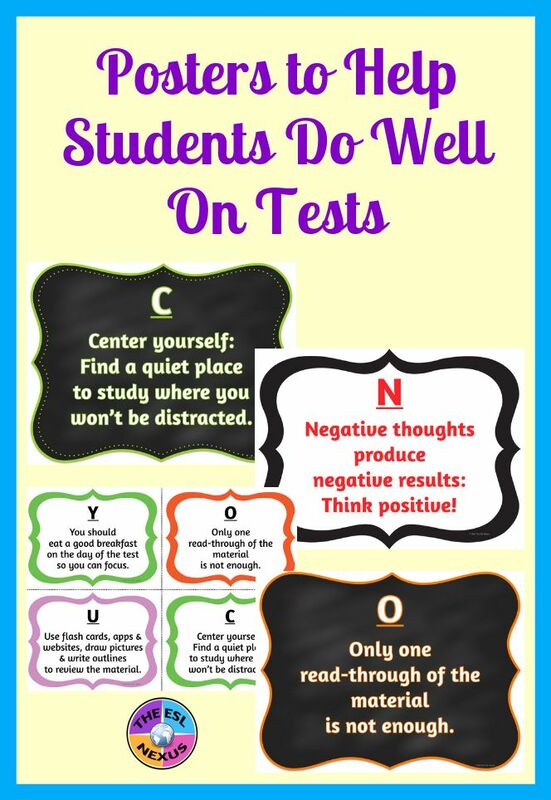 I also have a Pinterest board about assessment that you might find helpful. In addition to test preparation strategies, there are also test-taking strategies that can be taught as well as various websites for reviewing specific types of content material. For the content subject tests I gave my students, I always announced them several days in advance and reminded them every subsequent day about it, and spent the day before a scheduled test reviewing the material with them. I did various kinds of reviews so they wouldn’t get bored. When I had to administer the WIDA ACCESS test to my students, and the LAS test before that, I spent the week beforehand giving students practice tests to acclimate them to the test formats. 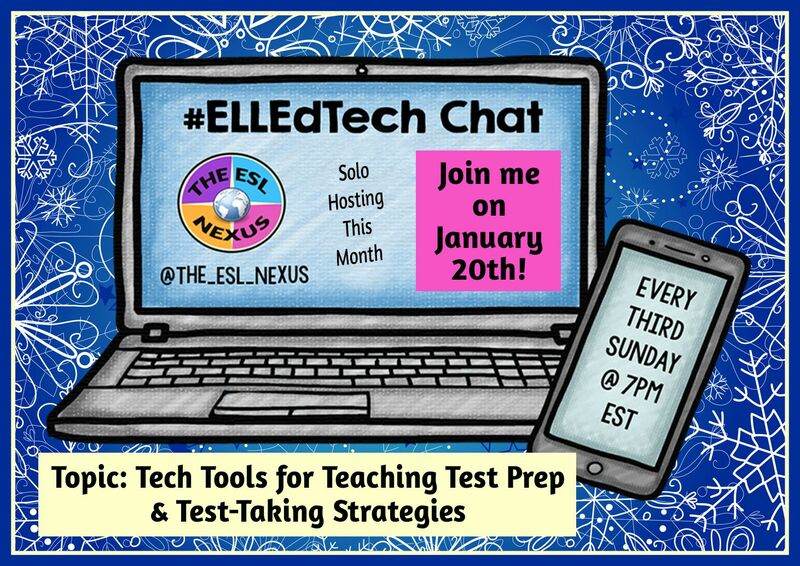 Since the time for administering the WIDA ACCESS test has begun, I thought it’d be useful to spend the next #ELLEdTech chat discussing Tech Tools for Teaching Test Prep and Test-Taking Strategies. Laurah, my co-host, isn’t able to join us so I’ll be solo hosting this month. Please join in so I’m not talking to myself! 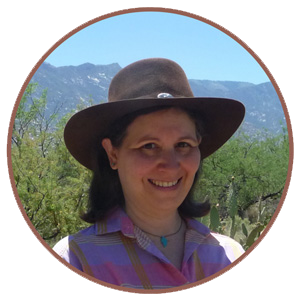 The chat is on Sunday, January 20, 2019, at 7pm Eastern, 4pm Pacific and Midnight UTC (sorry about that!). Below are the details. 7:05 = Q1: How do you prepare ELLs for classroom tests &/or standardized testing? #ELLEdTech? 4. Starting at 7:05, @The_ESL_Nexus will post questions every 8 minutes using Q1, Q2, Q3, etc. to identify the questions and the hashtag #ELLEdTech. You are welcome to let your teacher friends who might be interested in joining us know about this Twitter chat. And remember to check out my Pinterest board on Assessment and ELLs, which posts resources, articles and ideas about this topic.